It’s certainly true that “the best way to spread holiday cheer, is to sing it loud for all to hear”, which is exactly what the cast of Elf: The Musical did. The beloved holiday film hit the stage of the John W. Engeman Theater to the delight of kids of all ages. With catchy original songs, intricate choreography and many famous quotes from the movie, the musical could put anybody in the holiday spirit, including audience member, Michele Donaldson who came all the way from Connecticut for the performance. Based on the 2003 holiday hit movie, Elf starring Will Ferrell, the 2010 musical found major success on Broadway. It tells the story of Buddy the Elf, a human orphan boy who crawls into Santa’s bag and is taken back to the North Pole, where he is raised by the elves. This holiday production is directed by Matt Kunkel and choreographed by Mara Newbery Greer. The skilled cast didn’t miss a beat and performed sophiscated choreography that involved lifts, tap dancing and even ice skating. During the song, “Nobody Cares About Santa,” Santas of all kinds find camaraderie on Christmas Eve in a tap dancing number that makes you want to get out of your seat and dance along. “I thought it was right on target. It was super fun and full of talent,” Donaldson said. Buddy the Elf is played by Erik Gratton, the perfect fit for the jolly elf with a huge heart and little common sense. His rendition of Buddy, a character so many know and love from the original movie, is spot on. There is no shortage of laughs during the production as Buddy makes his way around the city, bumbling around with a smile on his face the whole time. The rest of the cast were also sensational, and each had their moment in the spotlight. Buddy’s love interest Jovie, played by Caitlin Gallogly, stole the show with her vocals in “Never Fall in Love”. The rest of Buddy’s family, Walter Hobbs, performed by Joe Gately, Emily Hobbs by Christianne Tisdale, and Michael Hobbs, by Zachary Podiar, each have their heartwarming moments that gave the show a touch of humanity. We saw the show “Elf the Musical” at the John W. Engeman Theater in Northport. It was fantastic. This adaptation of “Elf” was written by Thomas Meehan and Bob Martin, but it is based on the film written by David Berenbaum. This show is running right in our hometown! The atmosphere was ready for the holiday season with trees decorated with gleaming lights outside the theater. Before we arrived at our seats, we were treated to a delicious hot chocolate covered with either peppermint or extra chocolate. The stage design had beautiful, gigantic snowflakes along with a New York City skyline, which really got us in the mood for what was coming. As the curtain opened Santa was on his chair yelling at the television and cracking jokes. “Elf the Musical” is about a boy named Buddy who thinks he is an elf. When he was a baby, he accidentally crawled into Santa’s sack and got carriedto the North Pole. As he grows up, he realizes that he isn’t like the other elves, so he goes to Santa for help. Santa tells him his story and gives him directions to find his father, who doesn’t know he exists, in New York City. The rest of this show is Buddy’s adventure finding his father and love, and adapting to society. Throughout the play, Buddy, with Santa’s blessing, explores New York City in the search for his father. He finds his father working at the Empire State Building. Buddy and his father create a relationship and also find the true meaning of Christmas. All the actors and their performances in this production were superb. We especially liked the actors who played Buddy (Erik Gratton) and Jovie, his girlfriend (Caitlin Gallogly) because we felt like they told the story well through their emotions and enthusiasm. We also loved how the lighting designer made the lights move and complement the show. We thought the scenery was beautiful. We thoroughly enjoyed this production and would definitely recommend it. Although it is a Christmas story, we think it is still entertaining and good for all people. Even though there were some jokes and references intended for adults, it was still an engaging and appropriate story for little kids. We rate this show a perfect 5. Gather up the children and get them to the John W. Engeman Theater at Northport. The Engeman just opened its holiday show, Elf the Musical, which runs through December 30, and it is terrific. Erik Gratton, as Buddy, provides a delightfully uplifting rendition of the Elf we have come to love from the movie starring Will Ferrell, right down to a big sip of maple syrup right out of the bottle after a big squeeze onto the pasta he’s eating for breakfast. Mr. Gratton can sing and he can dance, but he also brings heart to Buddy at the Engeman, delivering punch lines and facial expressions that evoke uproarious laughter. Mr. Gratton is surrounded by a talented cast of characters. Buddy’s brother Michael, played by 12-year-old Zachary Podair, already a veteran on the Engeman stage, and his mother Emily, played by Christianne Tisdale, are a wonderful supporting cast. Their duets, “I’ll Believe in You” in Act I and “There is a Santa Claus” in Act II, are highlights of a show that just keeps getting better and better with each scene. Walter Hobbs doesn’t believe Buddy is his son, and has him thrown out of his office in the Empire State Building, landing him in the Santa photo display at the world famous Macy’s Department Store. There, Buddy comes in contact and then in conflict with the store manager, played perfectly in the movie image by Randy Donaldson. It is also at Macy’s where Buddy meets the girl of his dreams, Jovie, played by Caitlin Gallogly. Although a bit off for an Elf, the relationship evolves typically, a simple boy-meets-girl, a first date, a kiss, etc. But, when Jovie is stood up by Buddy at Tavern on the Green in Central Park, Ms. Gallogly’s star shines in “Never Fall in Love with an Elf,” a voice of beauty that accents the Engeman mantra of bringing Broadway to Main Street. Elf at the Engeman draws out the Christmas spirit in everyone, enough so that by the end, Santa’s sleigh flies off into the night sky. It is a wonderful holiday production not to be missed. Tickets may be purchased by calling the theater at 631-261-2900, online at engemantheater.com, or at the theater box office, 250 Main Street in Northport Village. Elf the Musical is produced by Richard Dolce, the Engeman Theater’s Producing Artistic Director. “We always try to tell our stories so people care about the characters,” Mr. Dolce said during an interview after the press night opening of Elf Saturday, November 17. “We want audiences to care about the journey, no matter what it is, whether it’s Don Quixote in Man of La Mancha, whether it’s Jack Kelly in Newsies, or whether it’s Buddy the Elf, we just try to tell the story so that you care about it. So, that by the end of the play you care about who they are and what they’ve gone through. Hopefully we’ve pulled it off again. Mr. Dolce said Jovie’s number “Never Fall in Love with an Elf” is one of his favorites. “What I love about her is that she is this tiny little person and then she comes out in that number and has this amazing voice,” he said. Other favorites are “Sparklejollytwinklejingley,” although he didn’t say it exactly right, by Buddy and the company, “because it is the first big production number.” He also said one of his favorites is “Nobody Cares about Santa Claus,” “because it is a good tap number and a great way to start Act II. Mr. Dolce said staging Elf has been challenging, especially because it is a blockbuster that has become so popular as a result of the Will Ferrell rendition in the movie. With Will Ferrell unavailable to play Buddy at the Engeman, Mr. Dolce said Mr. Gratton is great for the part. “He brings his own honesty and goofiness to it. And we try to make people feel and remember what they knew from the movie with the musical, so that is the challenge every time,” he said. BOTTOM LINE Corny but fun holiday romp based on the hit film. The Northport theater welcomes the season with this family-friendly adaptation by Thomas Meehan and Bob Martin of the hit 2003 movie starring Will Ferrell. Here the lovable, galumphing elf Buddy is played by Erik Gratton, who couldn’t be more comfortable in the role, having done it last year at Madison Square Garden. Buddy towers over the other elves and his toymaking skills are woefully lacking — no surprise since he’s really a human orphan who climbed into Santa’s sack one Christmas and ended up being raised at the North Pole. Santa (the delightfully jolly Gordon Gray, who also serves as narrator) spills the beans, revealing to Buddy that his publishing executive father, unaware he had a child, is on the naughty list because he’s lost the Christmas spirit. Needless to say, Buddy sets off to New York to do what elves do — fix things. It’s a corny, predictable story with a first act that could stand tightening, but the infectious performances win out under the direction of Matt Kunkel. Gratton is perfect as Buddy, an adorable klutz who mixes childlike wonder with worldly wisdom. Wandering the city, he ends up at Macy’s, where he meets his future wife, Jovie (Caitlin Gallogly), before finally connecting with his family — dad Walter Hobbs (Joe Gately), a stressed-out workaholic with little time for his wife, Emily (Christianne Tisdale), and son Michael (Zachary Podair). The ensemble gets quite a workout in the show, especially when, as elves, they are required to perform Mara Newbery Greer’s lighthearted choreography on their knees. Ouch! But the best number was the tap-dancing chorus line of fake Santas, in an eclectic mix of red outfits (love the Santa camouflage) by costume designer Leon Dobkowski. The charming set by Nate Bertone adds to the merriment. Whether you’ve been playing carols for weeks or are just now contemplating putting up the tree, the end of Thanksgiving signals the official arrival of the holiday season. If this is the most wonderful time of the year in your house, there’s no better way to enjoy it than by catching “Elf`The Musical” at the John W. Engeman Theater in Northport. Based on the beloved 2003 film starring Will Ferrell, “Elf” tells the story of a little boy who crawls into Santa’s gift bag and ends up at the North Pole. Raised as an elf, the ever-growing Buddy has no idea he’s really human, even though he’s a terrible toymaker. When Buddy learns the truth about his identity, he sets out on a journey to New York City to reconnect with his roots and find his family. Insulated by the always cheery atmosphere of Christmastown, it’s an understatement to say Buddy faces culture shock upon arriving in the Big Apple. But it will take a lot to keep Buddy from spreading Christmas cheer, especially to the person that needs it most: his Scrooge-y father. “Elf” made its Broadway debut in 2010 with book by Bob Martin and Thomas Meehan and music by Michael Sklar and Chad Beguelin. Devoted fans of the film will appreciate the show’s faithfulness to the original script, including Buddy’s classic one-liners that make it so iconic. The musical numbers aren’t especially memorable and feel unnecessary at points, but they do open up the opportunity for some great dance routines. The production begins with Santa (Gordon Gray) inviting the audience to join him as he reads the story of Buddy the Elf. There’s something so fun about these moments that allow actors to interact with the crowd and draw viewers in. And the little details in Santa’s scenes (his oversized chair with a bag of Doritos and the remote control stuffed in the cushion) feel genuine and cozy. Gray’s portrayal of Santa is effortless, funny and truly believable — his belly laughs will make you wonder if he’s the real deal. After fantasizing endlessly about what life with his dad will be like, Buddy meets his overworked, agitated publisher father, Walter Hobbs (Joe Gately). Tension rolls off Gately in waves, and when Hobbs loses his temper, Gately fills the theater with powerful, roaring tirades. He’s a wonderful foil to Christianne Tisdale and Zachary Podair, who play Hobbs’s wife Emily and young son Michael. Tisdale and Podair have great chemistry as mother and son, and their duets in “I’ll Believe in You” and “There Is a Santa Claus” were personal favorites. Of course, Buddy’s life is further turned upside down when he finds himself smitten with a beautiful, yet world-weary Macy’s employee, Jovie (Caitlin Gallogly). Gallogly is delightfully edgy and jaded for the majority of the show, making her character’s eventual thawing that much more enjoyable. She also has one of the strongest voices in the cast, and her vocals in “A Christmas Song” and “Never Fall in Love With an Elf” are a treat for the ears. The ensemble in “Elf” has several different roles to play, from elves in Santa’s workshop to retail employees and bitter mall Santas. They deserve major props for their elf scenes — since elves are tiny, the actors perform on their knees. It’s no small feat to sing and dance to “Christmastown” from that position! Choreographer Mara Newbery Greer and associate choreographer Tiger Brown are to be applauded for their hard work with the cast. The intense tap dancing in “Nobody Cares About Santa” is another impressive surprise. Set designer Nate Bertone creates a whimsical backdrop for the show, grounded by huge arches covered in snowflakes. The giant logos for Macy’s and Greenway Press are eye-catching, as are the creative use of props and background silhouettes to show scene changes in real time. While musical director Charlie Reuter and the small orchestra are tucked out of sight in the pit, they provide the perfect, almost cartoonish, accompaniment to this silly show. All told, director Matt Kunkel has led the Engeman’s cast of “Elf” in a production that’s loads of fun for the whole family — a perfect fit for the holiday season. A note on content: “Elf” does contain some brief mild language and lighthearted innuendo that most children won’t notice. The show is generally appropriate for all ages. If you have some extra money to spare, consider making a donation after the show to the Ecumenical Lay Council Food Pantry, which supports more than 150 local families each week. Cast members will collect donations as you leave. For more information, call 631- 261-4357. You better watch out, you better not cry, you better not pout, we’re telling you why, Buddy the Elf is coming to town! In fact, he just opened an effervescent production of “Elf The Musical” at the John Engeman Theater in Northport. 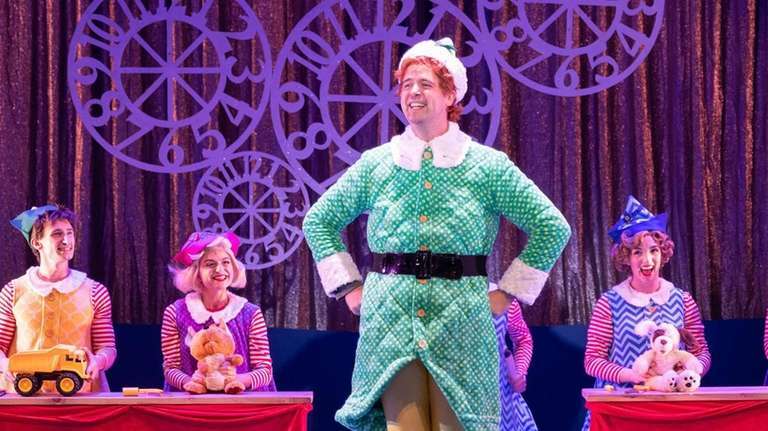 Based on the charming and popular film starring Will Ferrell, “Elf the Musical” has become the new holiday staple first staged on Broadway, then the Theater at Madison Square Garden, and now popping up everywhere. With swift direction by Matt Kunkel and fizzy choreography by Mara Newbery Greer, the Engeman’s “Elf” is spreading holiday joy and warming every heart. The experienced Erik Gratton plays Buddy, the elf who accidentally went home with Santa one Christmas Eve and grew up at the North Pole until one day, he sets out for New York City to meet his birth father. Along his journey, he meets many interesting characters, some nicer than others, and just wants to make people happy. So the quirky elf puts syrup on spaghetti and is enthralled with the paper shredder that makes unlimited snow! He means no harm and only wants to be a platinum member of his human family. Mr. Gratton’s fantastic Buddy takes us along his magical journey with pizazz. Each production number is a spectacle and Mr. Gratton relishes in the Christmas spirit right up to next Christmas. His father Walter Hobbs, played by the great Joe Gately, is definitely a softer soul than James Caan in the movie. Walter learns to love Buddy and reconnect with his distant family. Broadway veteran Christianne Tisdale is a loving and endearing Emily Hobbs, wife of Walter, stepmother to Buddy, and mother to Michael played by the excellent Zachary Podair. Master Podair has an outstanding singing voice and gives us reason to believe that everything will turn out alright in the end. Buddy’s love interest Jovie is played by the sweet Caitlin Gallogly who not only supports Buddy but proudly in act two ties up all loose ends. Standout performances include Nicole Hale as the wisecracking secretary, Richard B. Watson as scrooge Mr. Greenway, and Randy Donaldson as the energetic store manager. Other scene stealers include the magnificent Jacob Melssen and Matthew Varvar who appear in various roles throughout the production. Finally, Gordon Gray is a perfect Santa Claus. How could we give Santa a bad review? He serves as the storyteller and we wish him the same merriment he presented to all of us. All the stellar cast members are fun and fabulous including Lauren Gobes, Trevor Michael Schmidt, Danielle Nigro, AJ Lockhart, Andrew Aaron Berlin, Sophia Deery, Kieran Brown, Tiger Brown, and Halle Mastroberadino. As the holiday season approaches, “Elf The Musical” reminds all of us that family is most important and makes us wish that Buddy the “sparklejollytwinklejingley” Elf was a part of our family! The Cast of Elf. Photo by Michael DeCristofaro. “The best way to spread Christmas cheer is singing loud for all to hear”. The John W. Engeman Theater does just this with their holiday production of Elf the Musical. Based upon the popular film starring Will Ferrell, this musical has a book by Thomas Meehan and Bob Martin, with music and lyrics by Matthew Sklar and Chad Beguelin. Running until December 30th, and directed by Matt Kunkel, Elf is exactly what you hope it will be: campy, cute and Christmassy. Featuring the plot and your favorite lines from the movie (with slight tweaks), the play will be familiar to many. Buddy the Elf (superbly played by Erik Gratton), discovers that he is in fact human (gasp! ), and sets off to meet his father who doesn’t even know Buddy exists. Horror-of-horrors his father, Walter Hobbs (the brilliantly blustery Joe Gately) is on…the naughty list. A workaholic with no time for his wife and the son he is aware of, Walter is shall we say less than thrilled to have a fully grown Elf show up claiming to be his son. However, with his signature indefatigable cheer and unflagging optimism, Buddy sets off to instill the Christmas spirit within his newly found family and all he meets. Who knows? He might just make a Christmas miracle. Christianne Tisdale (Emily Hobbs), Joe Gately (Walter Hobbs) and Erik Gratton (Buddy the Elf). Photo by Michael DeCristofaro. With a fun set by Nate Bertone, great costumes from Leon Dobkowski, and entertaining choreography from Mara Newbery Greer, the humorous story of Elf is brought to life on the Engeman’s stage. Excellent sound design by Laura Shubert bolsters the entire performance, especially during an amusing rendition of “Carol of the Bells”. From the “little?” elves, all the way up to the big man himself, Santa Claus, this cast gives wonderfully merry performances. Gordon Gray is one of the best Santa Claus’ I’ve seen, with a perfect storytelling cadence, and the most believable laugh you’ve heard in a while. Erik Gratton’s fabulous grin and guileless expressions, combined with great comedic timing, make him perfect for Buddy. The lonely and jaded Jovie is drolly played by Caitlin Gallogly with a lovely singing voice. Christianne Tisdale and Zachary Podair are touching as mother and son, Emily and Michael Hobbs. While all of the cast gave fabulous performances, Nicole Hale as Deb stole every scene she was in with hilarious antics and killer timing. 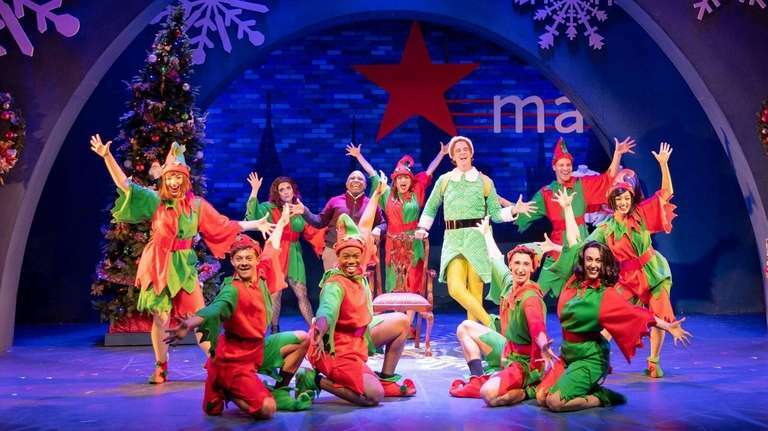 Fun and silly, charming and heartwarming, Elf the Musical is a delightful start to the holiday season.